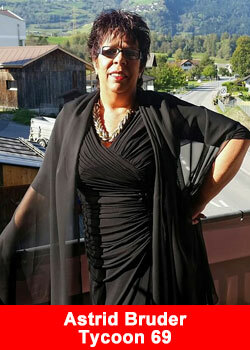 Astrid Bruder is one of the best sales people in Switzerland and has been enormously successful. She has been working full time in Network Marketing for more than 20 years – implementing her online strategies with her Team International. In a few months she registered with Tycoon69 well over 3,500 partners in more than 15 countries. In conversation with her came out quickly that she has found her home with Tycoon69. “This company is suitable for everyone in the world, with people at the top management that know exactly what they are doing. No product sales or loyalty system that breaks down after a few months. Everything is right here and we just started. To mention all the new things that are still coming, would take too long to explain. I love it simple and direct, it gives me great fun to support my team no matter how deep down in the structure. We are currently unique and that’s where the massive profit lies. The business is ready for the future and everyone will need it as a customer. The distribution partner is already massively rewarded, no matter in which country. One thing is important in the Powerline: The timing has to be right. The company has built 12,000 partners worldwide in less than 3 months. Right now, I see that partners register every minute, especially because of the Powerflow, which stimulates massive discussion in the industry, because something like this has never been created before. Get more information, fact and figures about Tycoon 69, click here for the Tycoon 69 overview.